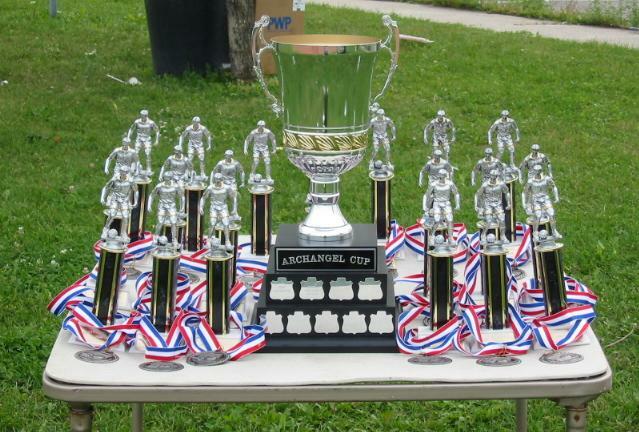 The Archangel Cup Tournament was started in 2002 as a way to build on our inaugural year and to offer the teams in the St. Michael’s Soccer Club additional games. The tournament initially consisted of ten teams lumped into one division. Aside from the addition of two new teams that year, all the rest were returning squads from our inaugural season. 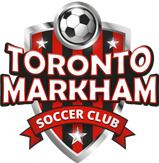 Since regular season play occurred on Sunday, tournament games for the first year took place on Saturdays, mainly at Carleton Park in the Warden and Hwy 7 area in Markham. The tournament was well received by the 10 teams and was a very nice complement to the regular season play and playoffs. The tournament finals of 2002 saw the Playoff champions from 2001, the Blue Devils, taking on the Regular Season Champs from 2001, The Rangers. There was some history between these two teams as the Blue Devils had ousted The Rangers in the first round of the playoffs the previous season giving them their only loss that year. 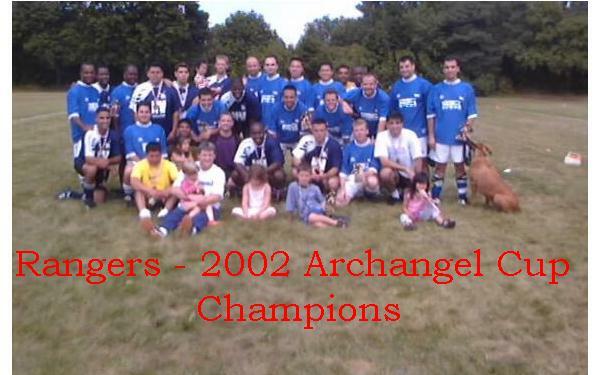 As fate would have it, the Rangers were able to avenge that loss and beat The Blue Devils in the Archangel Cup finals to become the tournament’s first championship winner. 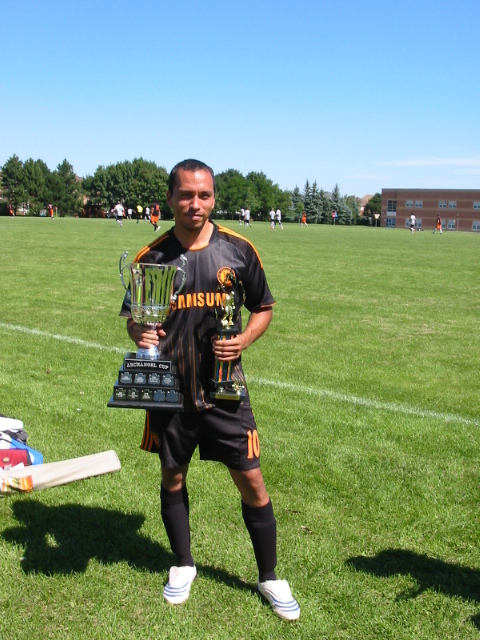 In 2003, the tournament dynamics changed significantly as St. Michael’s Soccer Club teamed up with Maple Leaf Soccer Club who was in their inaugural year. This turned into a classic case of the North vs the South as Maple Leaf S.C.’s games were held in the Pharmacy and Eglinton area. The number of teams had practically doubled, as now there were an additional 8 teams in the Maple Leaf S.C. to complete against the 12 teams in the St. Michael’s League. For the first time, many of the teams in St. Michael’s would be matched up against a squad that they had never played against. Aside from checking the stats page from their opponent’s league’s website, there really wasn’t much additional information that teams were able to obtain on each other which in the end, created some exciting match ups. In the grand finale that year, the defending tournament champions, The Rangers, would end up taking on Oshawa United from Maple Leaf. On paper, it was the match up that you hoped would happen as it pitted two top teams from both leagues against each other. However, in reality it wasn’t even close as Oshawa United trounced The Rangers 5-0 and gave the team their worst defeat in 10 years of playing together. Over the past 15 years, as both leagues have expanded, the tournament has grown bigger and better. The tournament has hosted as many as 40 teams and has even been divided into two divisions of play. Many of the teams have come to view the tournament as a major highlight and attraction of the season especially as it is uncommon for two different soccer leagues to come together and square off in an elimination style contest. In the end, the tournament champions have their team name etched onto the Archangel Cup Trophy for posterity to see. Bragging rights of some sorts, but in the end, if your team is able to be victorious in a tournament consisting of approximately 40 teams, then that is an accomplishment to definitely be proud of.